Median residential property prices in Melbourne and Sydney are expected to drop by up to $1000 a week this year with additional falls in 2019, according to Shane Oliver, chief economist for AMP Capital. 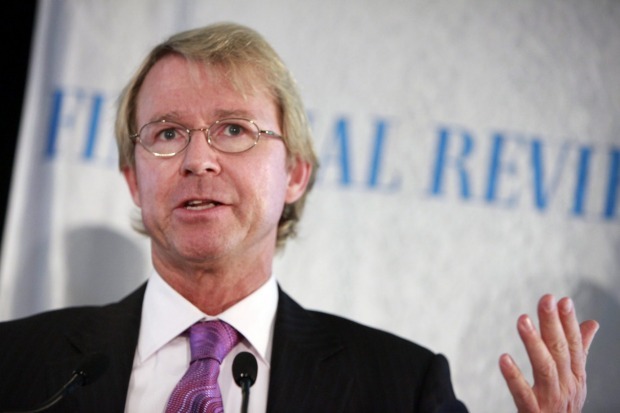 But a national property market crash, which would involve falls of about 20 per cent, was unlikely because of strong population growth, tightening lending standards and different economic conditions driving rises and falls in national capitals, Mr Oliver said. He predicted property prices in the nation's two biggest cities to slip by about 5 per cent this year. CoreLogic, which tips 10 per cent falls over the next two years, estimates median house prices in Sydney are about $1.06 million and $720,000 in Melbourne. "Housing is expensive on all metrics," Mr Oliver said. "It offers very low income (rental) yields compared to other growth assets. But it's dangerous to generalise." For example, prices for apartments in the nation's capitals are at their peak or beginning to slide, forcing many lenders to toughen inner city lending terms and conditions, according to analysis by Herron Todd White, one of the nation's largest valuers. 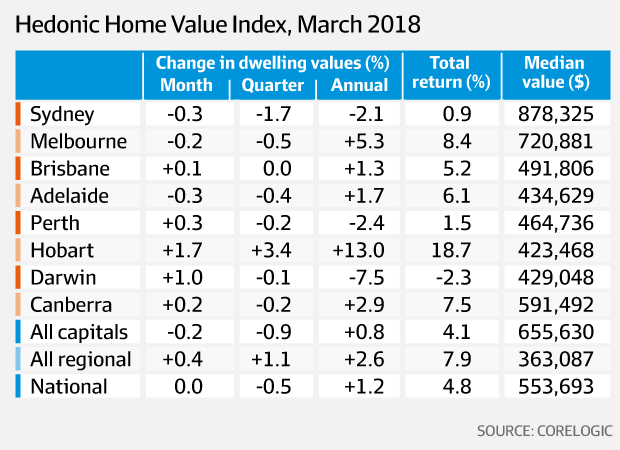 All mainland national capitals – except for Melbourne - have passed their peak and are either starting to decline, or are in a declining market and approaching the bottom of the market, HTW analysis reveals. Melbourne and the Gold Coast apartment markets are at the market peak, which means the next phase of the market is down. Sydney and Canberra's apartment markets are starting to decline, Perth and Brisbane are falling and Darwin continues to languish at the bottom of the market. Hobart is the only rising national capital. Lenders are responding to deteriorating market conditions by toughening lending conditions, particularly in suburbs surrounding capitals where large-scale apartment construction continues. Lenders like My State are imposing 70 per cent-loan-to value ratios for both owner occupiers and investors buying apartments. Tighter borrowing is imposed on about 35 postcodes around Sydney ranging from The Rocks to Strathfield and Castle Hill. The Real Estate Institute of NSW estimates Sydney vacancy around 2 per cent and middle and outer regions about 3 per cent. Continued high-density development at current record levels could lead to an over-supply over the next 12 to 18 months, according to analysis by HTW. About 30 postcodes ringing Melbourne and spreading into the south-eastern suburbs are facing tougher borrowing conditions for apartment buyers. They include Southbank, Carlton South, Collingwood North, South Yarra and Malvern East. Apartment demand in Melbourne is being driven by strong population growth but the market is vulnerable to several factors, ranging from rising interest rates, supply to state government buyer incentives. Similar conditions are imposed around Darwin and Perth apartments, which are struggling to recover from the mining slump. Lenders continue to try to build market share by offering rate discounts and other incentives to potential borrowers who meet the tougher responsible lending standards. Major banks are offering borrowers discounts of more than 190 basis points, particularly interest-only buyers where lenders are attempting to grab back borrowers after overshooting tough regulatory lending caps on the volume and velocity of lending. Separate analysis by SQM Research, which monitors prices and rents, shows current rentals in Melbourne and Sydney are performing strongly. Rents are rising by 14 per cent in Melbourne, seven times the rate of inflation, and six per cent in Sydney. But rental prices can vary widely between postcodes. National housing prices have fallen for the past six months, with annual growth the lowest in more than five years, according to recent official numbers. HTW believes Melbourne there is price growth potential for houses, which continue to approach the market peak. Brisbane, Adelaide and Cairns housing markets are either beginning to recover or in rising markets.